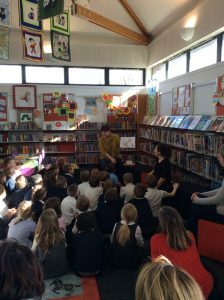 Oxgangs Library and the P2 pupils, who braved the cold wind and snow, from Oxgangs Primary School were great hosts today. It is amazing how children as young as P2 can ask you such brilliant questions about writing a book and how that book appears in the shops. This entry was posted in News by SPRRIT_1969. Bookmark the permalink. Copyright © 2017 Pauline Tait, All Rights Reserved. Content may not be used without permission.